SHETLAND Islands Council’s political leader Cecil Smith said he is more optimistic than ever following a “constructive meeting” with Scottish finance secretary Derek Mackay and islands minister Humza Yousaf over fair funding for inter-island ferry services. Delegations from Shetland and Orkney returned to the isles on Friday following a late afternoon meeting in Edinburgh on Thursday. Both island communities are working hard on the government to deliver on a commitment made several times over the last number of years that the provision of transport services should not place a disproportionate burden on any local authority. 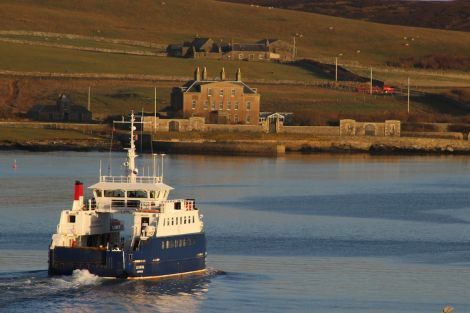 The SIC says it subsidises the running cost of the internal ferry service to the tune of £7.5 million annually, plus investment costs in new ferries and terminals. While the government has always insisted it was committed to fair funding for councils, it also said that the responsibility for running the ferry services was with local authorities. However, speaking on Friday, SIC leader Smith said he felt the pre-budget meeting had gone very well as Mackay had taken on board many points made by the two council leaders. “I am more optimistic than I have ever been before, and am I confident that after a couple of weeks of hard work we will, hopefully, get something towards the revenue cost of the inter island ferries,” he said. “The finance secretary understood more of the necessity of having good inter-island ferry services. “We discussed the exports of products from our north isles, such as salmon and whitefish, and I was able to point out that this not only benefitted Shetland’s but also the Scottish economy. His Orkney colleague James Stockan added: “The Scottish Government budget is yet to be set. “The finance secretary has said that he hasn’t ruled out providing us with extra funding, but that support will be needed from other political parties at Holyrood to secure it. Following the meeting Derek Mackay said in a statement: “Today’s meeting with Shetland and Orkney councillors was productive and it was useful to hear more details from the councils on their funding requests for 2018/19 which will be considered as part of the on-going budget process.